I’m in New York. Again. I arrived via Paris a few days ago. Via Paris because if you had a choice to transit through a European city, you too would choose Paris over Frankfurt. Even over Amsterdam. Just for some great, if rubbery airplane bread. And wonderful cheeses. And Fromage Frais. 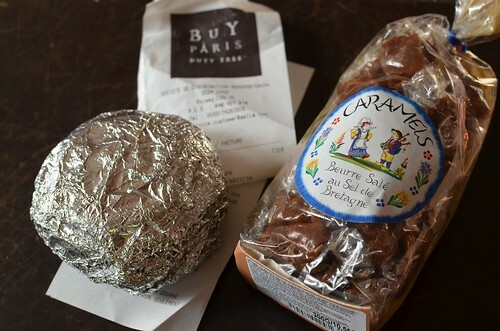 You would seek out delicious caramels au beurre salé, made with fine salt from Guérande. You would choose to peer into Ladureé’s jewellery shop where macarons preen and sit pretty. Wouldn’t you want to feast on a pain au chocolat, with jus d’Orange while the music of the French language ferries you on? When your flight is delayed by an hour, you too would rejoice ‘Yay, more time in Paris’ even if you never leave the airport. 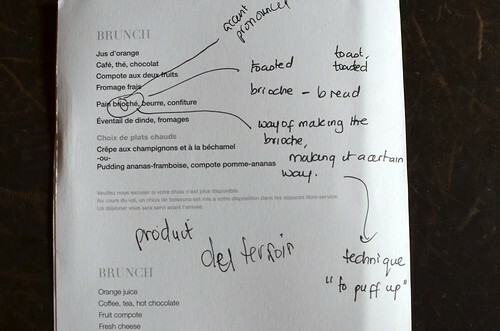 You would board the flight and happily have a French man….a French foodie sit on your left-hand side. You both would talk about hams, and cheeses, beer and Le Creuset pots. You would learn some French when the food arrives: Coings is Quince – the same pronunciations as Coin which means corner, in French. You would discover that there are two ‘brioche’ words: brioche and brioché. And take a French class, mid-air. One without an accent on the last ‘e’, and one with. Brioche meaning the sweet, enriched bread we all know. And brioché, meaning in the style of brioche. This could refer to the technique of toasting brioche or the ‘rising’ of bread dough. Who knew that? 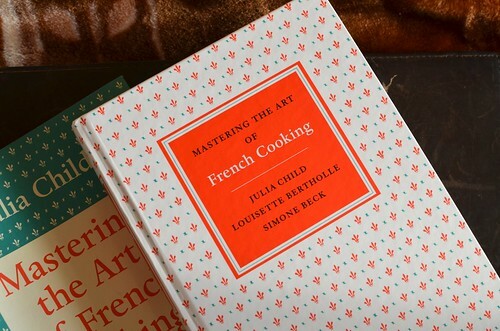 I believe I will learn more about French cuisine, with my brand new copy of Julia Child’s Mastering the Art of French Cooking. Purchased yesterday at TJ Maxx! You can view pain brioché as either a very rich white bread or a very lean brioche (only 1 stick of butter per pound of flour vs. real brioche’s 3 sticks of butter). You would arrive in New York City, to the freshness of winter, feet clothed in boots and shoulders cloaked in a grey wool ensemble. Pieces of one’s wardrobe that have been strangely quiet for 12 months. Just in time to see the lighting of the giant Menorah in Central Park….on television, and to attend the Santa Convention. Not. On December the 15th. 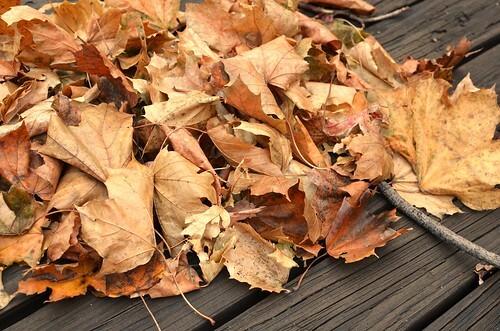 New York would welcome you with Autumn’s leftovers, like a Parisian runway. Tall, dark models of trees – stems almost black, with branches turned in every compass direction. Modelling autumn-winter fashion, a tree! 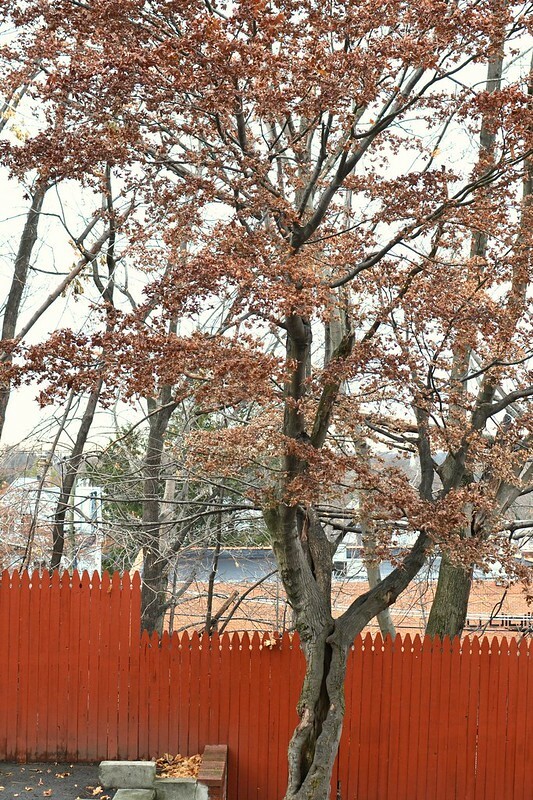 Golden, bronzed and reddened leaves hanging on like pendants. Gorgeous to look at on a light, misty grey canvas that is fog. 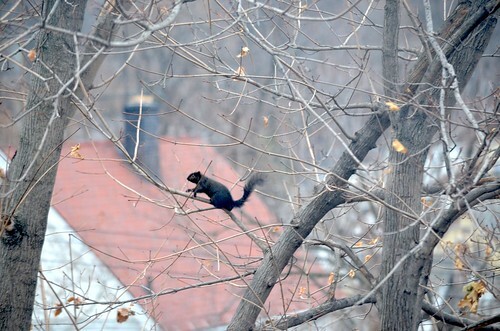 Black, bushy tailed squirrels would dance on burnt orange picket fences, and run up trees – a beautifully, naked landscape that I embrace with delight. I’ve missed my four seasons. I stand in a warm kitchen, talking to my sister, and to other family members eating some fruitcake, only a week old. I hold a warm mug of tea in one hand, stand by the kitchen sink and look out on this winter wonderland. 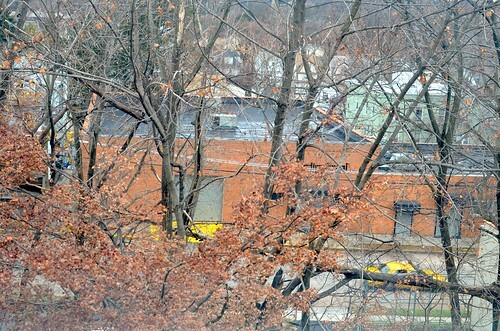 The window is slightly ajar, the fresh air streaming in is so pure, and clean, I could bottle it. In a few days, I’ll be an aunt again. And my sister, very pregnant is demanding that I bring out more of the fruitcake she’s eating. I want to stop calling it Christmas Fruitcake, as is the tradition. Because traditions should be ‘on-time’. Even though this year, I’m one up on making them. Last year, the cakes were born on the 9th of December, and this year they have been made a whole 6 days earlier! That’s a feat for me. I thought the cake last year was wonderful but for the last 12 months, I’ve been thinking hard about how to infuse more brandy flavour into the cake, and make it even fruitier. Like all passionate cooks know, one try, one bake…is not enough. Even the simplest recipes can be improved upon, made anew. I think I am getting there with this recipe, slowly and carefully crafted. 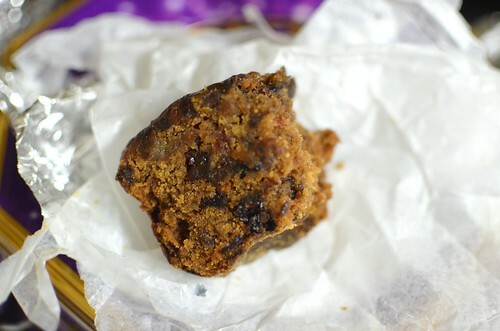 Typical fruitcakes use alcohol-soaked dried fruits, often a combination of raisins, currants and sultanas in brandy, gin or rum. 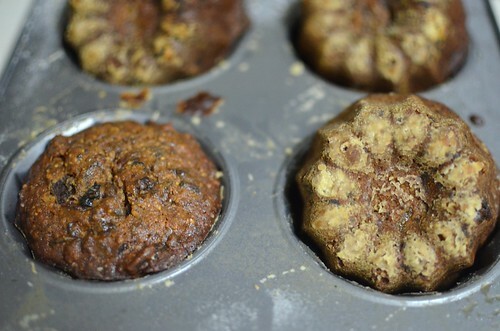 These cakes are also made months ahead to allow the alcohol mellow and the flavours deepen. But I never have the luxury of time to make these cakes months ahead. Which is why I’m proposing to myself to call them ‘The world’s best New Year cakes’. You with me? Because I lack time, I’ve made up for it by finding a way to smooth out the harsh alcohol flavours…and no, this isn’t done the traditional way of soaking the fruits for weeks before making. No sir. I’d rather eat my alcohol…thank drink it! 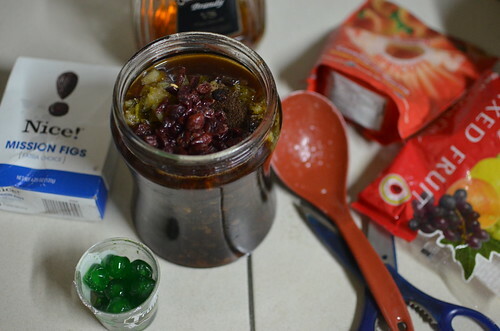 In my case, I soak the fruits in brandy overnight with some sugar and dried spices. 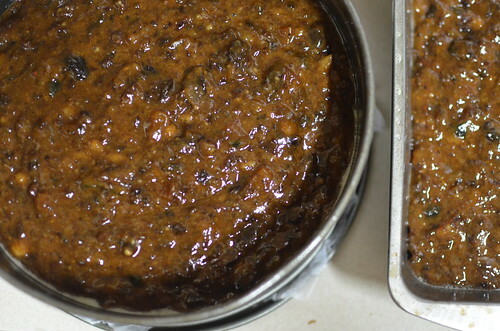 I then puree half the mixture, till all the fruits are finely chopped and have a texture remniscent of mincemeat. This isn’t a cake for nuts. For crunch. 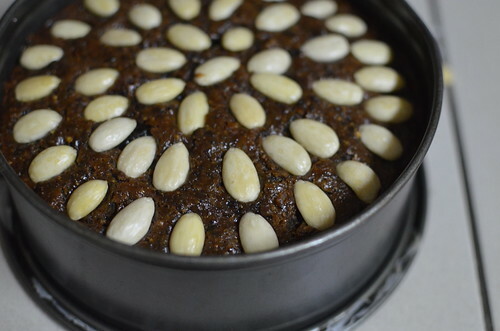 It is a dense, rich fruitcake that is chock full of sweet, fruity flavour; fragrant with all the warm and festive spices of Christmas – vanilla, cinnamon, ginger. It has a nice soft and cohesive texture, thanks to a portion of finely chopped brandied fruit. 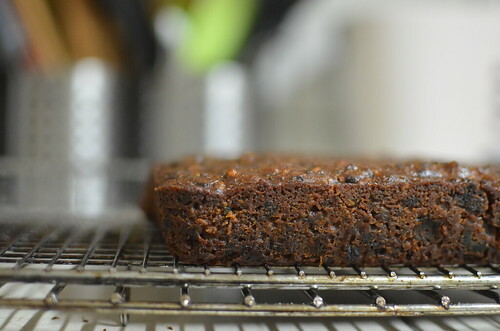 It is everything you want in a fruitcake and most of all, eating it the day after won’t have you knocked out with alcoholic fumes, or unable to appreciate the fineness that is fruit cake. 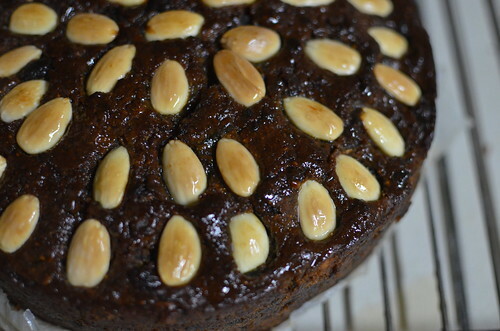 And because I discovered that you can make a fruitcake look good, I decided to stud mine with blanched almonds in concentric circles, in the manner of the Scottish Dundee Cake. Tips from Canada Living: To keep these dense cakes moist and evenly coloured during cooking: Choose shiny pans; line with white parchment paper. To blanch whole almonds you will need a clean tea towel, a mug or deep bowl, boiling water and whole almonds. Place the almonds in a mug or bowl and pour boiling water over them. Allow them sit for about 1 minute. Drain and place on the tea towel, forming a pouch by gathering up ends of the tea towel to form a ‘money bag’ with the almonds. Rub the towel, and the almonds with a circular motion to remove the skin. 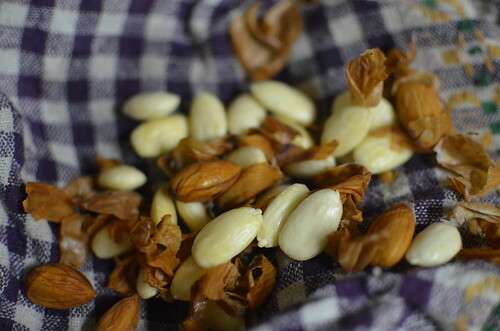 Open up tea towel, remove and discard the brown skin – whole, blanched almonds for your use. Combine the brandy, 2 tablespoons of sugar and spices in a jar. Stir well, then add the dried mixed fruit and mixed peel and leave to soak for a minimum of two hours and up to six weeks on the counter, in a cool dark place. When ready, divide the fruit into two equal portions. 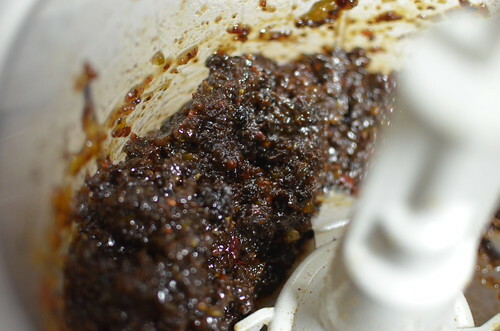 In a food processor, blitz one portion, till the fruit is minced and the texture is a thick fruit paste, reminiscent of mincemeat. This fruit puree is sticky and gooey and infuses the cake with true fruit flavour which brings it all together. In a large pan, combine the fruit paste, the other half of the soaked dried fruit and any remaining liqueur, cherries, apricots, mission figs, sugar, butter, zests and juice of the lemon and orange and all of the brandy-liqueur from the soak. Bring slowly to the boil, stirring until the butter has melted, about 10 minutes. Reduce the heat and bubble for another 10 minutes, stirring occasionally. Meanwhile, pre-heat the oven to 150C/Gas 2/Fan 130C and line two cake tins with greaseproof or parchment paper, greasing before and after laying the paper at the bottom of the tins. 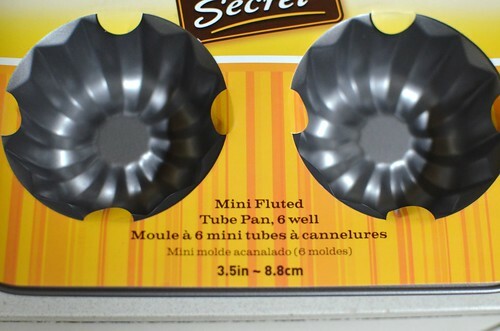 I made two batches of this: in the first instance, I used 2 sets of mini-bundt tins, and the second batch was baked in 8″ pans: a round, spring-form tin and a square tin. When the mixture has cooled down, add the eggs and ground almonds and mix well. Sift the flour, baking powder and spices into the pan. Stir in gently, until there are no traces of flour left. Fold in the chocolate chips and the candied ginger, if using. Spoon the mixture into the prepared tins. Place in the centre of the oven and bake for 45 minutes. Then turn the heat down to 140C/Gas 1/Fan 120C and cook for a further 1 hour for the mini-bundt tins, and up to 1 and 1/2 hours (or up to 1 ¾ hours if you are using gas) until the cake is dark golden in appearance and firm to the touch. Cover the top of the cake with foil if it starts to darken too much. To check the cake is done, insert a fine skewer or a small knife into the centre – if it comes out ‘dry’, without cake batter clinging to it, the cake is cooked. Make holes all over the warm cake with a fine skewer and spoon or brush on the extra brandy over the holes until it has all soaked in. Leave the cake to cool in the tin. When its cold remove from tin, peel off the lining paper. 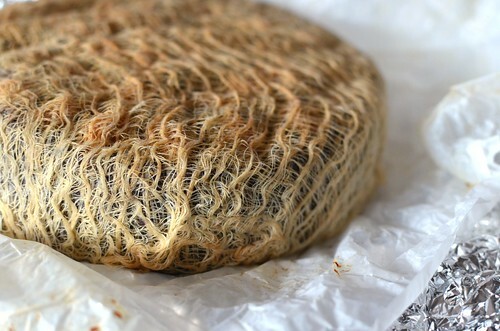 Pour some brandy into a small bowl and soak a large piece of cheesecloth in it, till it is completely saturated. 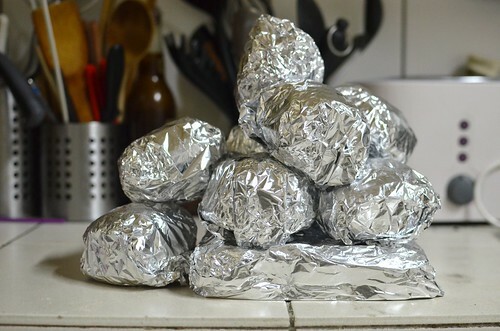 Wrap this around your cake, then follow with baking parchment or greaseproof paper and then aluminium foil. To prepare a fruitcake for short-term storage you’ll need a square of cheesecloth large enough to wrap around the fruitcake and a bottle of good quality brandy, rum, cognac, bourbon or whiskey. 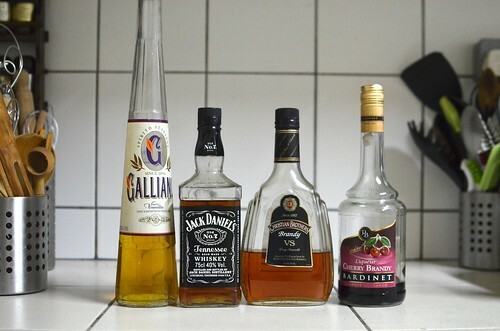 Pour enough liquor into a small bowl to soak the cheesecloth until it is completely saturated. To prepare the fruitcake for longer storage, you’ll need a piece of unbleached muslin to wrap around the cake. Muslin is better for long-term storage because it retains more moisture than cheesecloth. Soak the muslin in liquor until it is wet through. The purpose of this liqueur soaked cloth is to protect the surface of the fruitcake and keep it moist as the alcohol is slowly absorbed into the cake. I seriously have the best fruitcake in New York. Don’t even think of calling me the only Fruitcake in New York. Cause I ain’t. 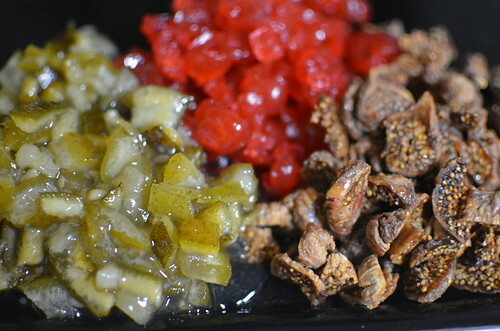 Make some fruitcake. But whatever you do, I hope you have a fantastic Christmas season. And a wonderful new year. With cake. Any cake, especially Fruitcake!